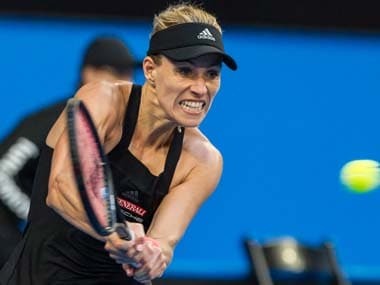 Singapore: Angelique Kerber was given a harsh reminder of the pressure she faces as the new world number one when she was pushed to three sets before winning her opening match at the WTA Finals against Dominika Cibulkova on Sunday. The German was pushed all the way by an inspired Cibulkova before the Slovakian finally cracked and Kerber prevailed 7-6 (7-5) 2-6 6-3. Although it was not her most convincing display, Kerber’s hard-fought victory underlined her determination to cap her incredible season by adding the prestigious end-of-season championship to her Australian Open and US Open titles. 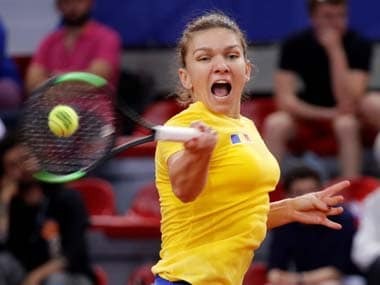 Simona Halep, who looms as one of Kerber’s biggest threats, also laid down an ominous marker as she demolished rising American Madison Keys 6-2 6-4 in the first match of the $7 million tournament. A finalist two years ago, the Romanian looked in great touch on her return to Singapore’s purple indoor hardcourt, needing just over an hour to win her round-robin contest with Keys. The big-hitting Keys struggled to find her rhythm against Halep, who is one of the most tenacious counterpunchers in the game, committing 18 unforced errors and losing 13 points in a row to concede the opening set after just 27 minutes. “There were definitely some nerves today, which I don’t think is surprising,” said Keys, who was appearing in the elite eight-player event for the first time. Despite being in control, Halep also had a moment of self-doubt in the second set, and even called for her coach Darren Cahill, who told her to relax and keep playing the way she was. Halep immediately broke Keys to grab the early advantage in the second set but a sloppy service game allowed the American to draw level at 4-4. However, Halep regained her composure and broke straight back then served out the match to go straight to the top of the Red Group standings after Kerber needed three sets to win her group match. “I panicked a little bit because I missed some easy shots,” Halep said. There was no sign of the battle that was to come when Kerber broke Cibulkova in the opening game and comfortably held her own serve but the seventh-seed clawed her way back and forced a tiebreaker. Cibulkova conceded the tiebreaker when she hit a forehand over the baseline after a long rally but dominated the second set from the outset, applying pressure to Kerber with her penetrating groundstrokes into the corners. Cibulkova seemed to have gained the ascendancy when she broke Kerber early in the deciding third set but the world number one dug deep and reeled off five of the last six games to clinch victory. The four players in the White Group, Agnieszka Radwanska, Karolina Pliskova, Garbine Muguruza and last-minute qualifier Svetlana Kutznetsova, all play their opening matches on Monday.